A vital skill for any crowdfunding investor is the ability to quickly narrow down your choices to focus your valuable time on the only best opportunities. Everything looks awesome and you don’t want to miss out on all of these amazing startups so you want to invest in everything right away OMG where do I send the check? You take a more prudent approach, and wanting to be thoughtful about where you invest your hard-earned money, you start reviewing the detailed documentation for every available investment, reviewing the financial projections, looking up all of the founders and advisors on LinkedIn and Twitter, researching the competitive landscape using a site like Crunchbase or Owler, and maybe seeing if there’s anything to glean from reviews of the company or product on sites like Glassdoor or Yelp. Four hours later you’re halfway done looking at one investment option. Getting excited about every startup’s potential is understandable: it can be thrilling to bask in the founders’ enthusiasm and imagine getting in on the ground floor of The Next Big Thing. But there’s some big downsides to letting that enthusiasm (a mostly emotional response) drive your investment choices (which should be a mostly rational response). First, investing in everything is also known as “spraying and praying”, and while you’re bound to hit something along the way that does well, those positive gains will almost certainly be more than offset by the losers. Second, if you do start digging deeper into the choices, it might be to find ways to justify or rationalize the emotional choice you’ve already made, rather than to rationally evaluate the company and investment on its merits. On the other extreme, while approach #2 is a legitimate start to due diligence, if you do it for every possible investment, then just like #1 it’s a recipe for low returns. At best you’ll burn out doing that much research (while likely ignoring the opportunity cost of your own time and attention), and at worst you’ll find yourself in “analysis paralysis” unable to make a final choice as you keep seeking “one more” piece of information about the investment. One of the best things about becoming a crowdfunding investor is that you can now get started with as little as $50 or $100, but that also means that it’s very unlikely to be worth more than a couple hours of your time (if that!) to research a potential investment of that size. A guiding principle for many successful investors, including Warren Buffett and Peter Lynch, is to only invest in businesses that you can understand. And as you’re getting started as a crowdfunding investor, that’s great advice to keep in mind. For example, you’re in a much better position to evaluate the credibility of a company’s claims about their new dog-walking startup launching in New York if you actually have a dog and live in New York. You’ve already got enough to learn about the ins and outs of different security types, differences among crowdfunding investment platforms and the mechanics of the crowdfunding investment process itself, so when you’re starting out as a crowdfunding investor consider only investing in companies offering products or services that you yourself might use. Are you able to realistically judge whether what they’re saying is credible? Do you think you will be able to tell whether it’s a good product or not? Does it seem obvious to you how they will make money? Enough money to grow significantly bigger than they are today? Are there competitors out there you know about to compare against (and to prove there’s a market)? For most of the investments you’ll see, chances are you just won’t know enough about the market or the industry or the sales channel involved to make any personal judgments. And that’s fine! Practice crossing investments off so you can save your energy for evaluating and digging deeper only on the ones that are the best fit for you - that way you can avoid getting drawn in by a slick pitch about a product or market you know little about, and you also avoid wasting time and energy digging deep into too many potential investments. I’ll briefly go through all seven, limiting the analysis only to what’s shown on the Republic site. 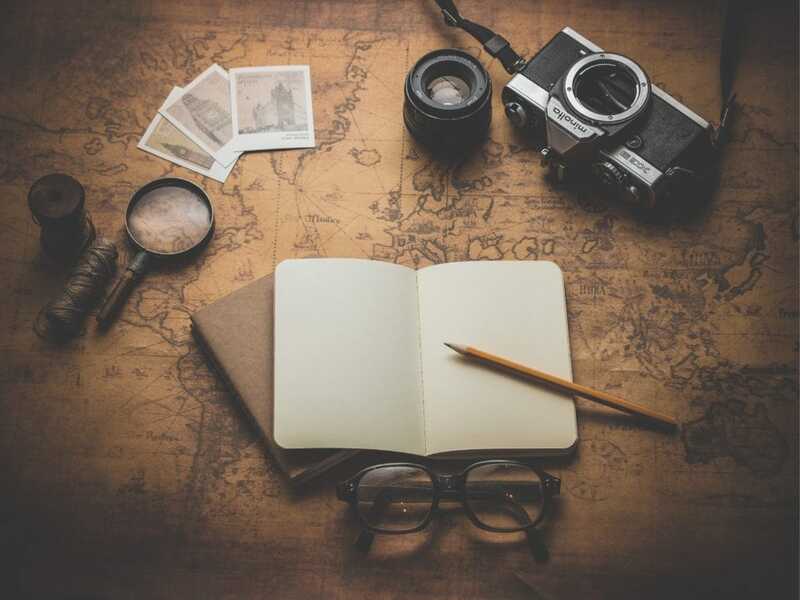 While formal due diligence as a crowdfunding investor will mean consulting a lot of other sources, in this first “elimination round”, you can cross a lot of choices off your list based only on what the company provides. And although I’ll be showing how I’d filter these based on the “invest in businesses you can understand” principle, please note that’s just from my specific perspective and opinion. You might come to very different conclusions about these based on your own unique experience and background. 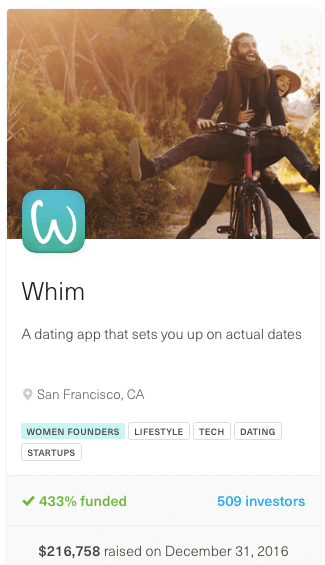 First up is Whim, an online dating app. I haven’t been on a date with anyone besides my wife since last century, so there’s just no way I can reliably judge the viability of the product or evaluate the experience relative to the competition. Pass. I haven’t bought eyeglasses in at least a decade (and can’t recommend Lasik enough! 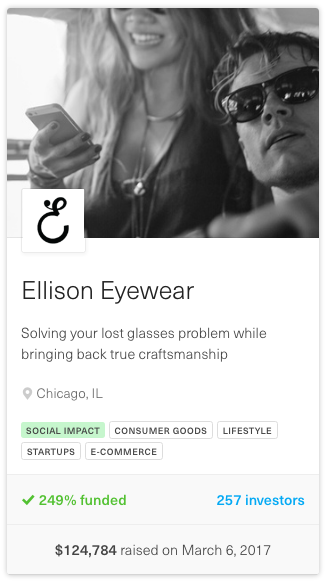 ), so again I don’t feel like I could judge the product or opportunity, especially relative to new competition like Warby Parker. Pass. I’m sure there is a lot of business opportunity around helping protect people from the spread of Zika and other insect-borne viruses. 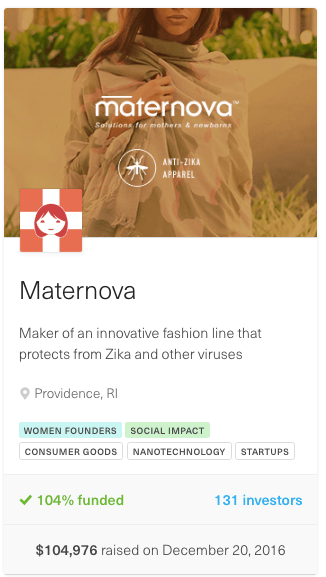 But I know even less about Zika than I do about women’s fashion (or fashion in general), so I’d pass on this one too. This one definitely piqued my interest enough to click through and look more closely at some of the details. 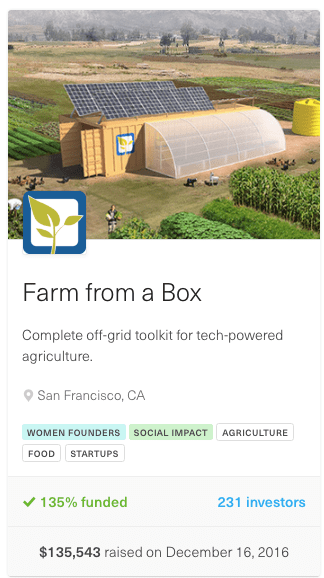 It’s a self-sufficient farm that arrives in a shipping container and can support 2 acres of crops! 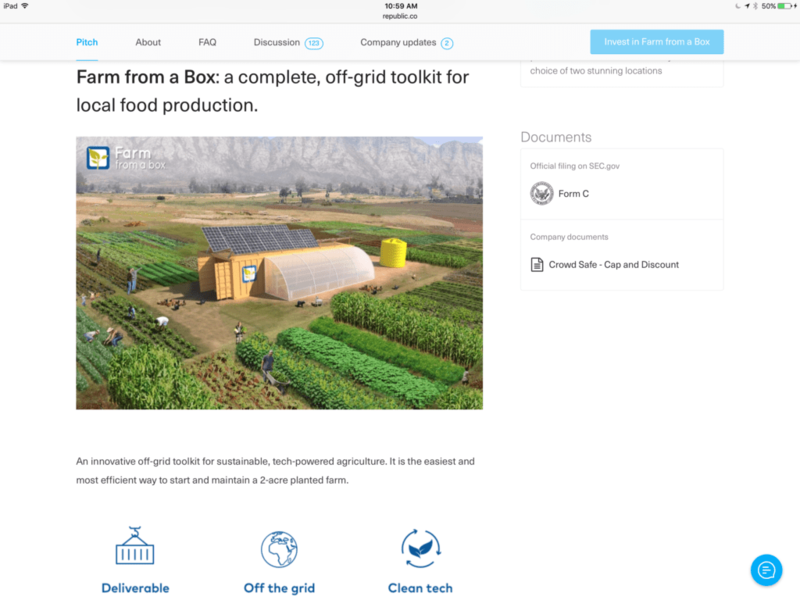 I’m super bullish on solar, and this looks like a really clever way to jump-start food production without much infrastructure. But the reality is that I don’t know anything about farming, and so have no frame of reference against which to evaluate the company, the product, or the market. So have to pass on this one as well. Although I don’t quite consider myself “young” in the actual sense of the word, I’d like to think I’m young at heart, and certainly identify as entrepreneurial. 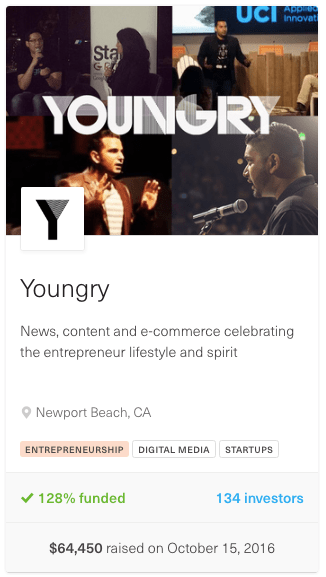 And I’ve spent enough time on Medium to know that founders and entrepreneurs sharing inspiration and life hacks is probably 80% of the content there, so “news, content, and e-commerce celebrating the entrepreneurial spirt” sounds interesting enough to take closer look. Youngry™ is an entrepreneur media company who will be the ESPN for entrepreneurship. Our mission is to unite the entrepreneurship ecosystem with a democratized platform for entrepreneurship news, original video programming, and e-commerce products to help an entrepreneur become successful. The company was founded by a two time White House award winning entrepreneur, and a globally recognized entrepreneur, whose created some of the largest movements in social media today. OK, now we’re getting somewhere. I have two kids, they like toys, and I don’t think we as a society do enough STEM education in early childhood. 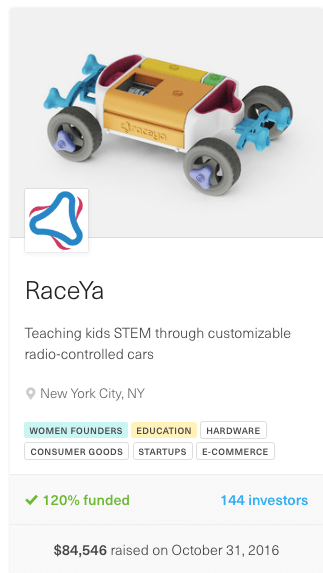 The concept (fun race-car kits targeting girls) sounds fantastic, but I know very little about hardware companies, and I do know enough about toys to know it’s a brutal ecosystem with a lot of big brands with money. While I very much look forward to checking this out as my daughter gets a bit older, as an investment opportunity, it’s not a fit. Reluctantly pass. At Pearachute, we believe parents and children should spend more time playing and less time planning. But parents of children under 5 face a dilemma. We want our children to discover new activities they love, so we sign them up for art, swimming, music, and soccer. But by the third visit, our 2 year old is crying in the corner or refusing to get in the water, and they still have 9 sessions left that can’t be refunded. With two kids under 5, and having lived in several different places during that time, we know all-too-well how hard it can be to find great activities, especially ones that don’t require a long-term commitment or membership (and in toddler time, even a few weeks is definitely “long-term”). I also know that many of the businesses offering activities are small, local entrepreneurs either going it alone or franchising from national brands to draft on marketing support, with tight margins and minimal advertising budget. So there’s an obvious need from the business’ side to attract and retain new customers, which means this one’s appealing not only for parents but also for business owners. This one would definitely warrant a closer look into more detailed documents and financials. So that means of the 7 companies I looked at, only one was building a product I could see myself using and/or have recent experience with the market and audience, which means I seriously narrowed down the choices for spending further energy on research and due diligence. 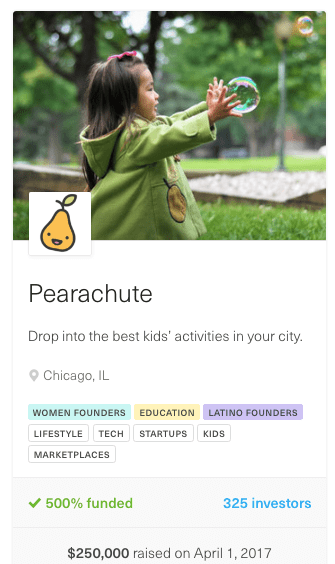 I don’t know enough to say whether I would invest in Pearachute, but in a few minutes was able to quickly know I wouldn’t be investing in the others. Again, that’s just what made sense for me – the important thing is to look at from your own unique perspective and experience. YMMV. While the crowdfunding investment platforms have done a lot to make investing in startups and real estate look and behave quite like online shopping, it’s still investing, not shopping. It’s difficult as a crowdfunding investor to directly compare two startup investments the way you’d review a feature matrix for digital cameras, so you shouldn’t feel obligated to just compare what’s available and pick one. Ideally you’ll (quickly) reject the majority of investment opportunities you see on a crowdfunding site, leaving you with ample time and energy to carefully and closely look deeper at the ones you do like. That way, as a crowdfunding investor, your default is the “don’t” diligence of finding reasons not to invest, and only when you can’t easily eliminate a choice should you even bother taking a closer look at the underlying offering.